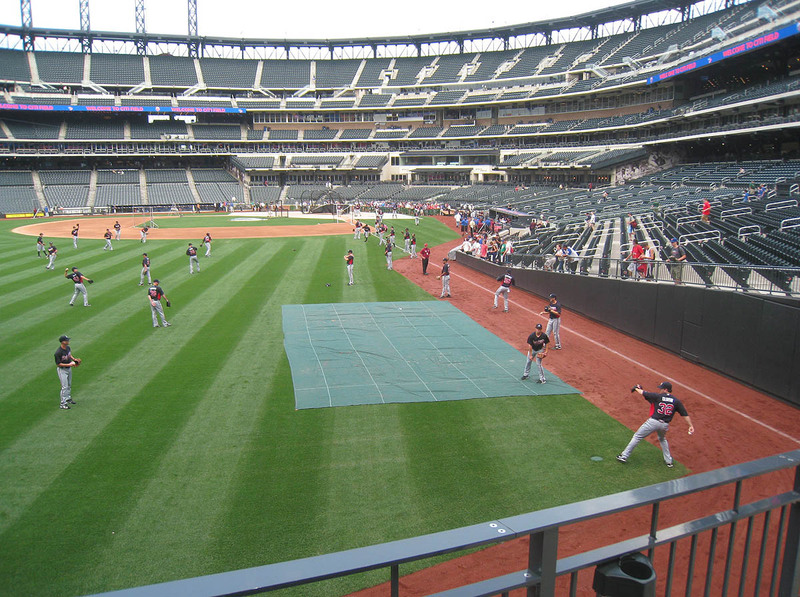 The Mets were nowhere in sight, and the Braves were slowly getting ready to hit. 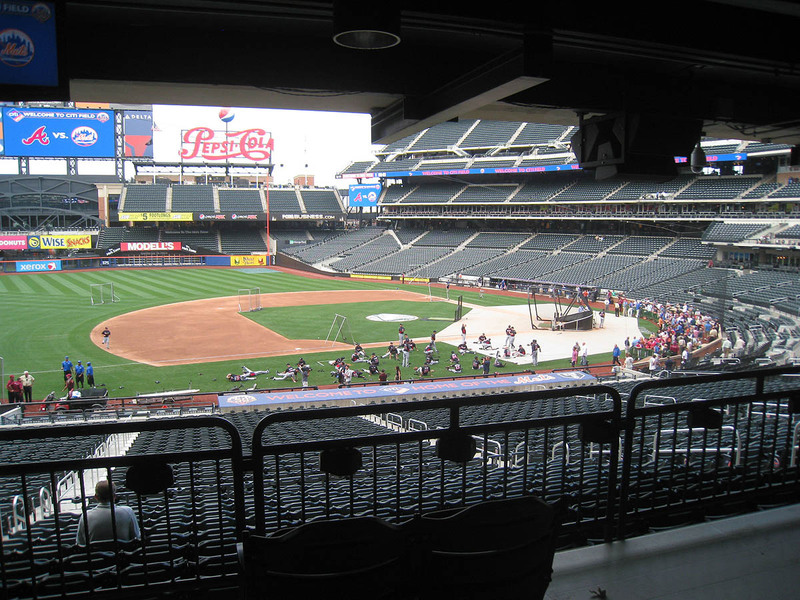 I later heard from a security supervisor that the Mets *had* taken BP; for some wonderful reason, they just happened to finish at around 5pm. When the Braves finally started throwing, I noticed that Chad Durbin was the odd man out, so I asked him if he wanted to play catch. He smiled and thought about it for a moment, and as he turned to toss me the ball, Kris Medlen shouted, “DON’T DO IT!!! HE’S A BALLHAWKER!! !” (For the record, it’s ball-hawk, not ballhawk-er. I don’t particularly care for that word in the first place, so it’s doubly irritating when people get it wrong.) I was half-annoyed and half-amused by his antics, but not surprised. 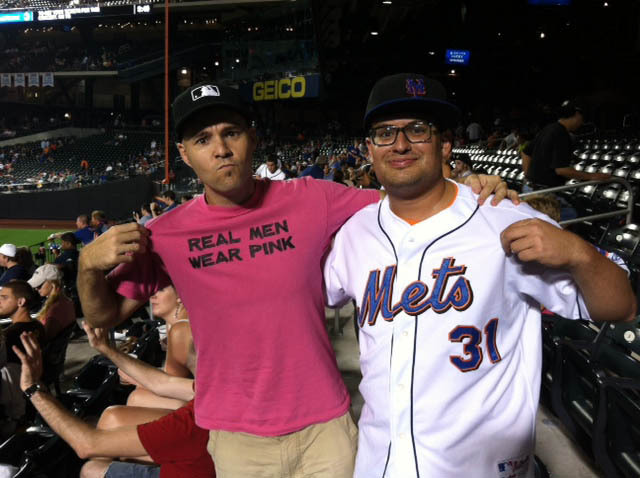 (Medlen, you may recall, had recognized me on 8/12/12 at Citi Field and called me out for changing into Braves gear.) Thankfully, though, Durbin still tossed me the ball, and we played catch for about 30 seconds. That’s when Durbin’s throwing partner showed up, so he kept the ball and used it to get loose. In the photo above, Durbin is on the lower right, wearing No. 32. Medlen is the next guy over, standing on the corner of the tarp. The first ball that I snagged was a home run that landed in the second deck. When I ran upstairs to look for it, I discovered that two balls had landed there; I only got one because there was another fan already scouring the seats. 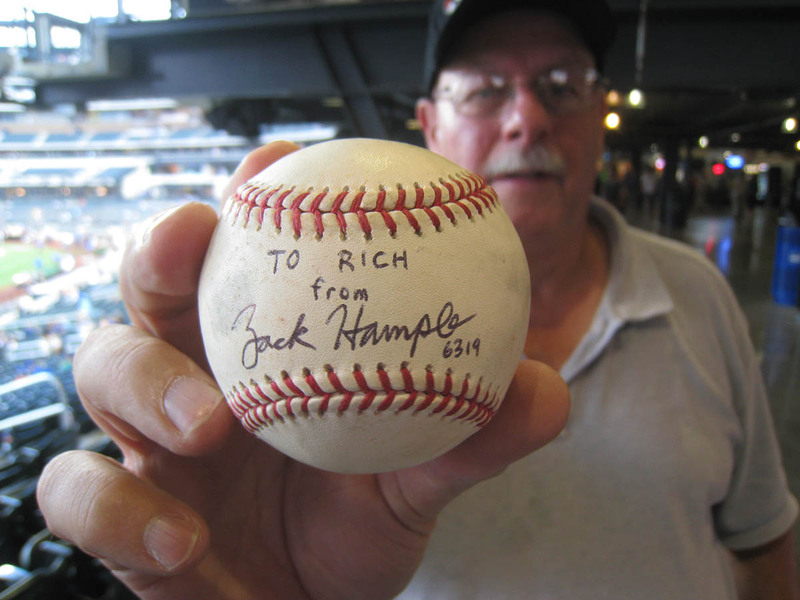 Now, do you happen to remember the guy named Tim who asked me to sign a ball last season? 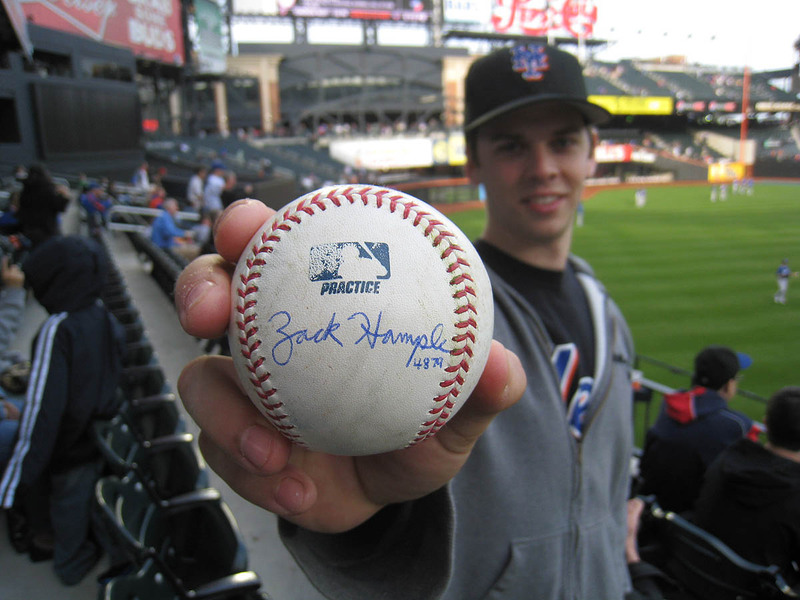 I’m guessing you don’t, so to refresh your memory, this was the game when I met him, and here’s a photo of him holding it. Does that ring a bell? No? Well, Tim is a really nice guy, and he’s good at catching baseballs, and I’ve seen him several times since last season. I’m mentioning him now because he was at this game, and I owe him one. 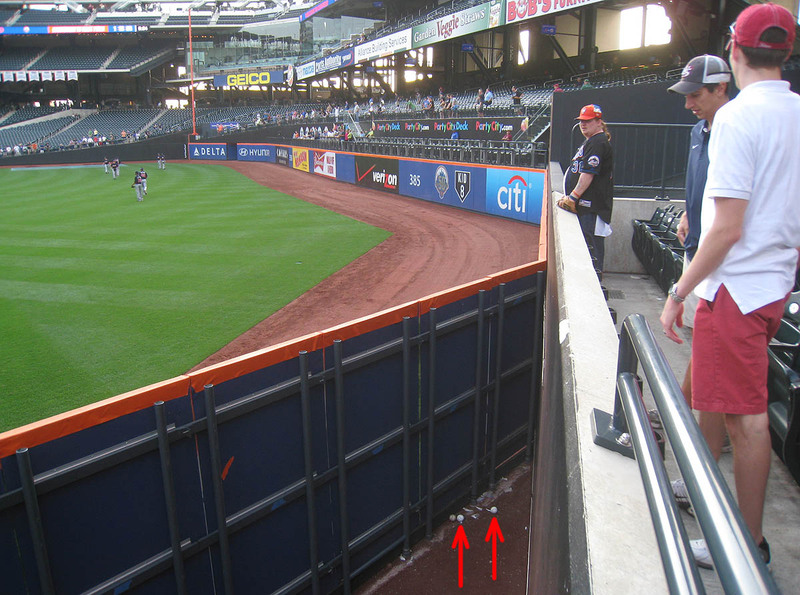 My second ball of the day was a home run that landed near him in left-center field; it eluded him as it trickled down the steps, so I was able to run over from my spot two sections away and snag it. That’s not why I owe him. 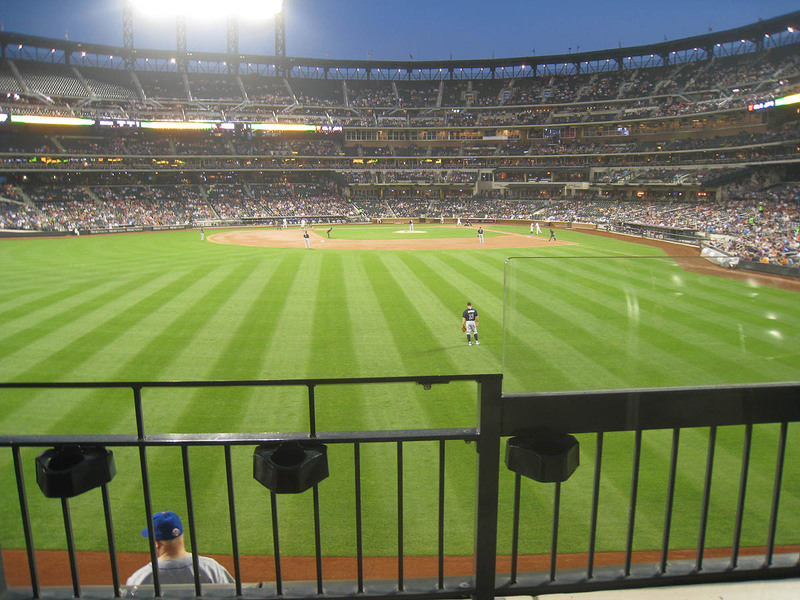 My third ball was a home run that I caught on the fly in left-center, reaching waaay out over the railing. That’s not why I owe him either. I owe Tim for the next ball that I caught — another home run, this one off the bat of Reed Johnson — because he probably could’ve caught it. 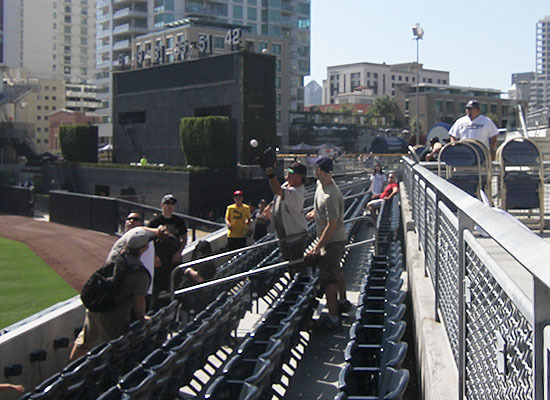 Do you remember when I backed off from a BP homer on 7/21/12 at PETCO Park so that my friend T.C. could catch it? Well, that’s what Tim did here for me, except he still kinda went for it. I got the sense, though, based on his positioning in the stands, that he could’ve outreached me if he’d really tried, so I gotta say “thanks” and give him the assist. My fifth ball of the day was a Martin Prado homer that I caught on the fly. It barely sailed over a kid’s head in the front row, so I immediately handed it to him without thinking. 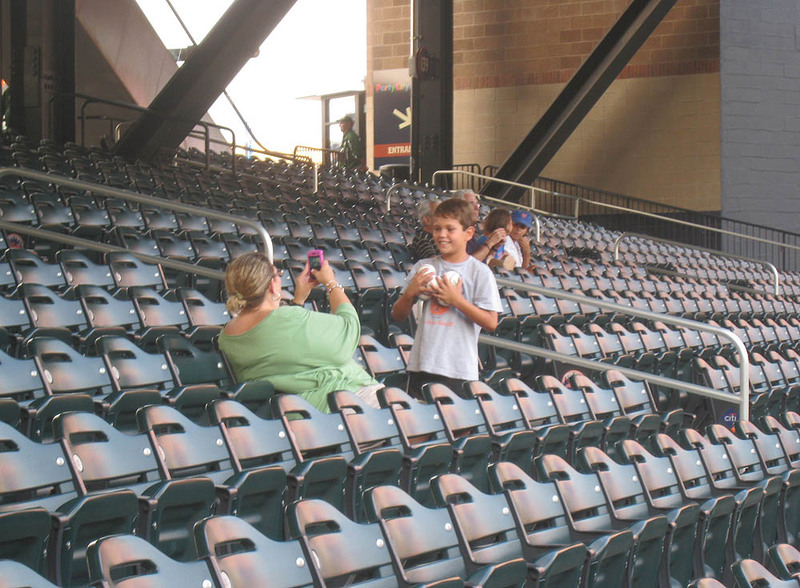 See the kid holding all those baseballs? Yeah. That’s who I gave the home run to. It was his fifth ball of the day, and I’d seen him catch all the others. I just instinctively handed the ball to him without realizing what I was doing. I don’t blame him, though. In fact, I like him. Catch four and go for another? Hell yeah, kid. That’s how to do it. If you look closely at the photo above, you can see a third ball, which is considerably dirtier than the other two. I didn’t bother going for it because (a) I was paranoid that security was coming for me, and (b) it didn’t look like an official ball. I never did see the logo, but I could tell based on the raised seams that something was off. Of course, while I was dickin’ around with my glove trick in right-center, half a dozen homers landed near my spot in left field. My eighth ball of the day was a J.C. Boscan homer that I caught on the fly in left-center. I reached right above a middle-aged man for it, who was reaching for it himself with his own glove . . . so I handed it to him. I prefer to give balls to little kids, but there are exceptions to the rule. My ninth ball of the day happened to be the 500th ball that I’ve ever snagged at Citi Field. 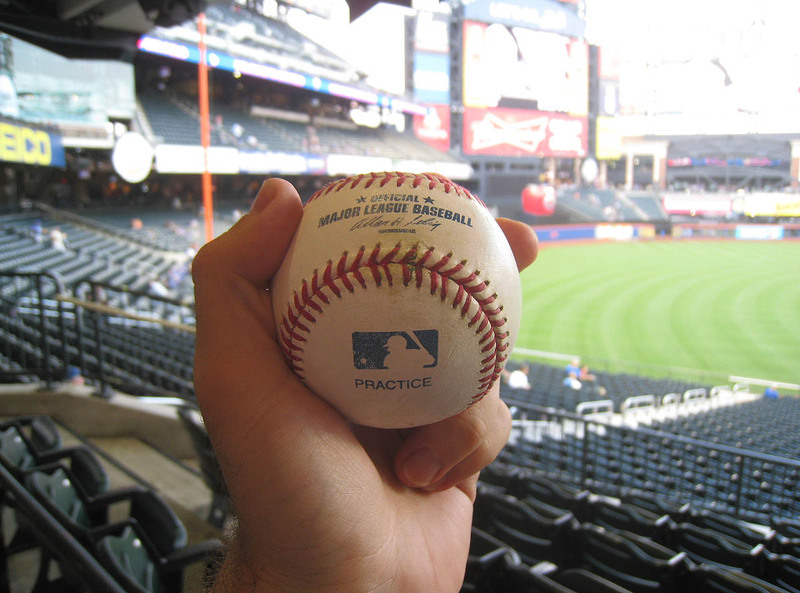 It was thrown by Randall Delgado, and as soon as I caught it, I stuck it in my pocket so that I could mark it after BP and take a picture. I was fully aware of that milestone before it happened, but I completely spaced on the fact that my next ball — No. 10 on the day — was my 500th of the season. It was a home run (hit by Boscan, I think) that barely eluded Tim’s girlfriend’s glove and found its way into mine. As you can see, the seams are asymmetrical, and the “practice” stamp on the sweet spot is way off-center. A ball like this would never find its way into a game, but it’s still good enough (according to the Braves) to be used in BP. This was the last series that he’d ever play in New York (unless, of course, he doesn’t actually retire, which would be hilarious). 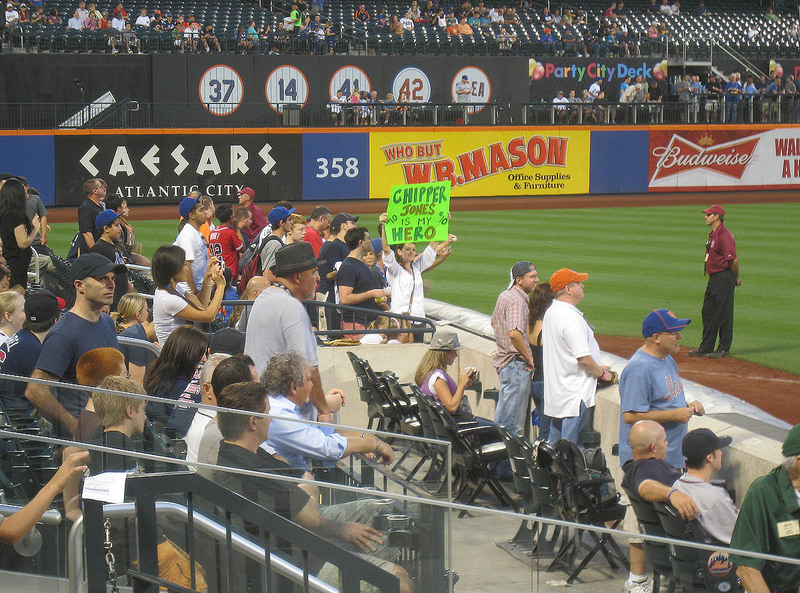 Some fans made signs for him . . . There seemed to be a decent amount of room to run — several empty rows, or least empty parts of rows. As I often say, the key to catching batted balls, whether during BP or the game itself, is to have lateral range. Sitting on a staircase is important, but if you can’t *also* run left and right, you’re gonna have a bad time. 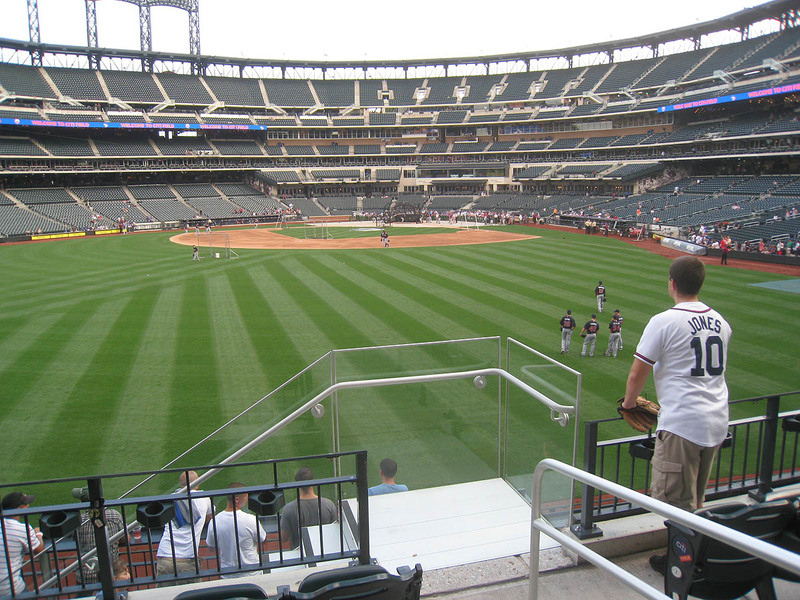 I was in the 2nd row in straight-away left field, and I had lots of room to run — that is, until a bunch of terrible people sat in my row one inning later. I ended up moving here . . .
Chipper grounded out weakly to 2nd base. Then Freddie Freeman came to bat and grounded out too. 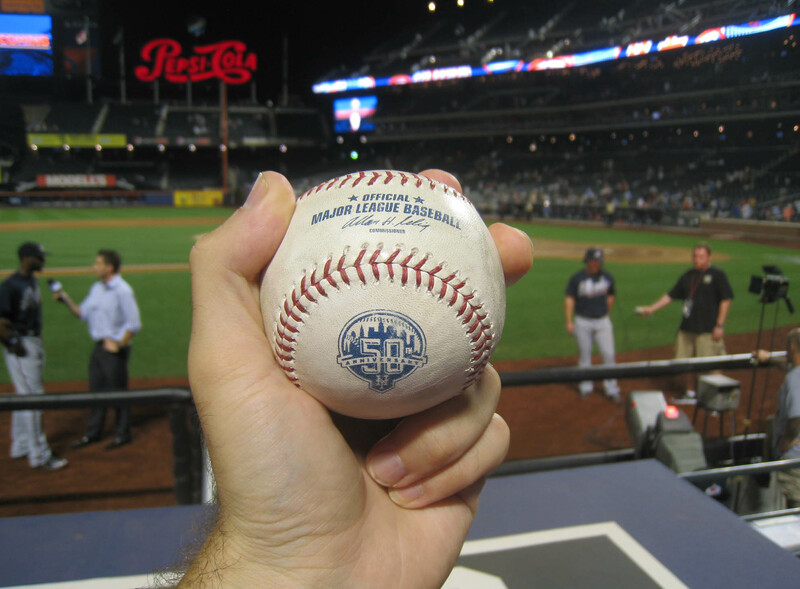 It seems that no matter where I go or what I do at Citi Field, it never results in my catching a game home run ball. There’s often room to run, but there’s never anything to run for. It was a random guy named Jared who recognized me. He was there with three friends, and he was really cool, and we all chatted for a bit. 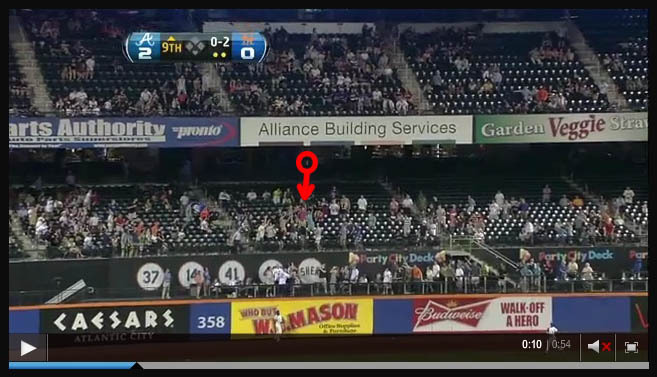 Basically, I sat with them (several rows back in the middle of the section) whenever there was an inning break or a left-handed batter. 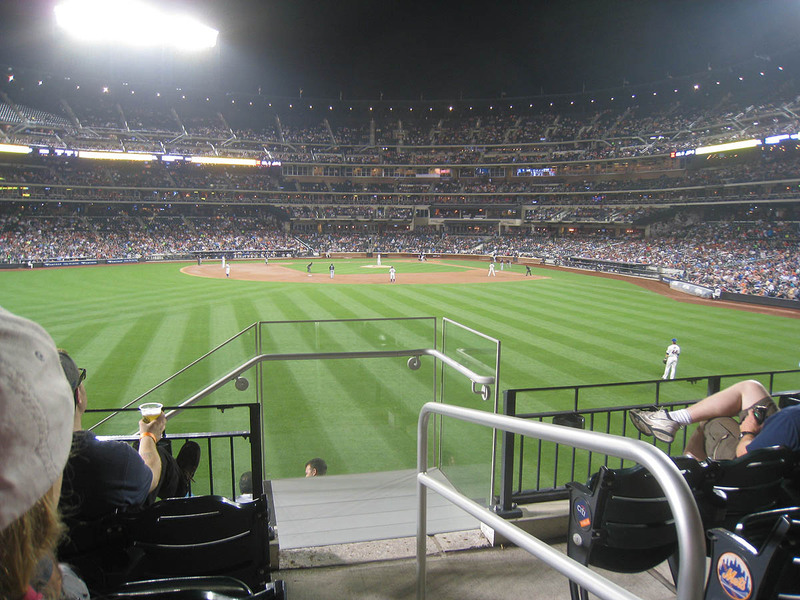 Every time a righty stepped to the plate, I politely excused myself and moved down to my seat on the staircase. Jared and his friends knew the deal and found it quite amusing. Real men wear . . . Mike Piazza jerseys. 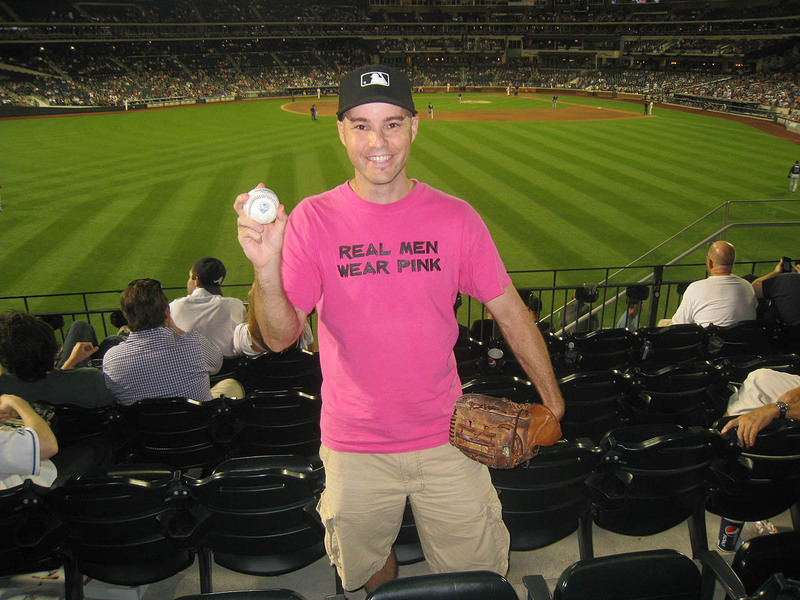 As for the pink shirt, I regret not tweeting about it earlier that day because NOW that I’m mentioning it, you probably won’t believe me, but whatever. I’m an honest person, and you can ask my girlfriend. She was there when I put it on in the morning. The ball was a towering fly that kept drifting and drifting. I’m pretty good at judging the high ones, and this one was as easy as it gets. The first thing I did was jump out of my seat. 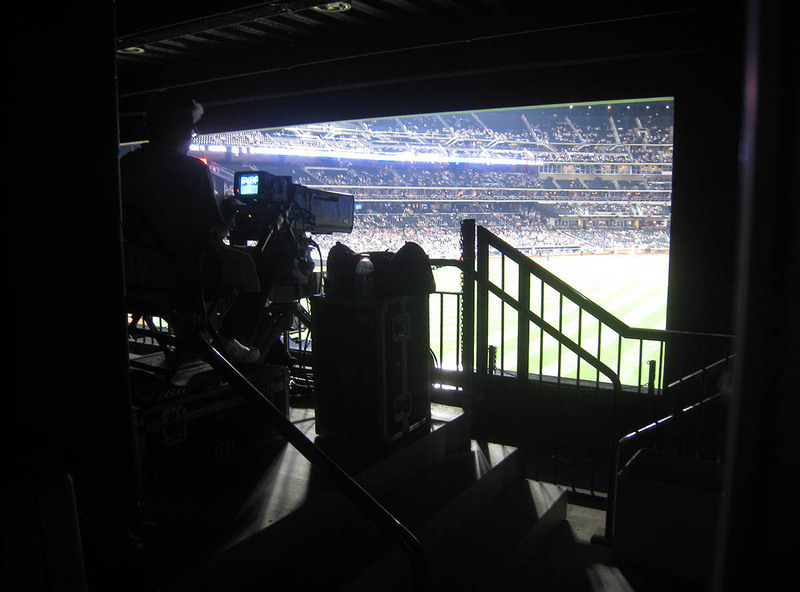 Then I crossed the staircase, moved one row back, and drifted 20 or 30 feet to my right. I flaunted my beautiful shirt for the cameras . . . When it became clear that I had no intention of parting ways with my souvenir, a 20-something-year-old fan (who had already been reprimanded by security for behaving inappropriately) wandered over from the adjacent section, got so close to me that I could smell the cheap beer on his breath, and demanded that I throw the ball back. In retrospect, it was probably a bad idea to say anything to this guy. He was one of those people who was looking for a reason to get into a fight. “Are you a Mets fan? !” he shouted. Two things happened between innings. First, Jared took my picture with the ball . . .
. . . and second, the drunk fan in the next section tried to fight me. I happened to glance over in his general vicinity, at which point he abruptly stood up and pointed at me and then jabbed his finger in the direction of the concourse. I tried to make a calming gesture, as if to say, “No thanks,” but he kept at it. Jared told me that he had my back — but Jared wasn’t planning to leave after one out and head toward the dugout. I thanked him and said goodbye, and as I started heading up the steps, the drunk guy also headed up, one section over. What the HELL was going on? Thankfully, there were security guards at the tops of both staircases. I told the guard closer to me that I didn’t want to fight — that I just wanted to walk through the concourse and be on my way. “Just walk alongside me,” he said, and he literally escorted me toward/past the next section so that he was positioned between me and the seats. Meanwhile, the guard in the next section blocked the staircase so the drunk guy couldn’t get out. It was truly absurd, and I was ashamed not only of my city, but of humanity. 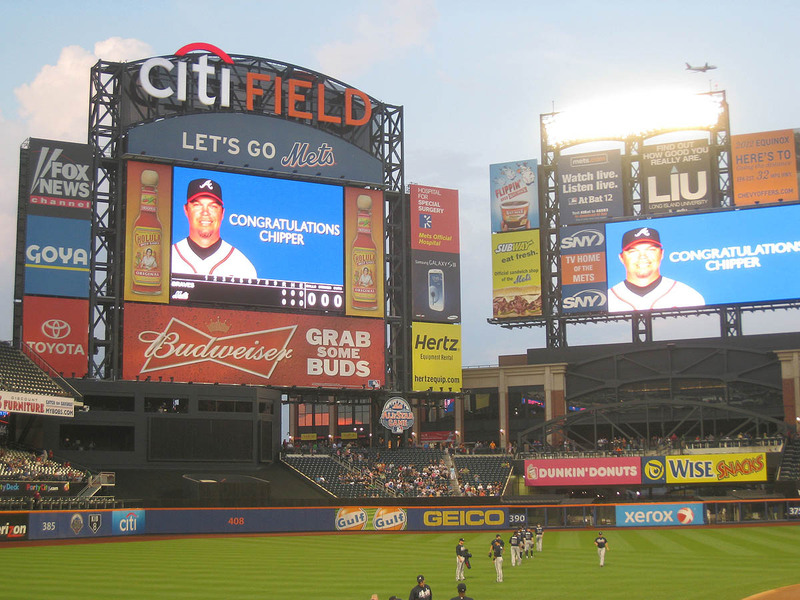 Final score: Braves 3, Mets 0. • 501 balls in 63 games this season = 7.95 balls per game. Wait! One more thing! Are you aware that I’ll soon be making another attempt to catch a baseball dropped from 1,000 feet? Monday, September 10th. That’s the date. I’ll be back at LeLacheur Park in Lowell, MA, trying once again to make history. Click here to see my blog entry from my first attempt, and stay tuned for an update . . .
You should have had uggla sign it and ask him to tell medlen the ballhawk says hello. I’d love to see what you could do spending a full season in the bleachers in a stadium with space that doesn’t sell out much. 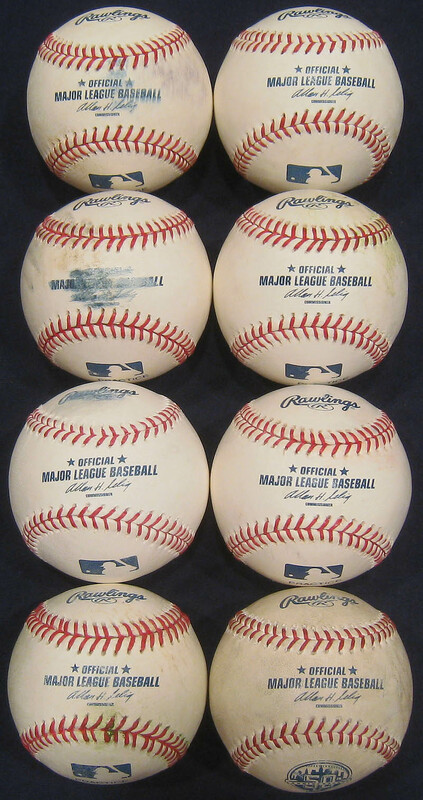 Which ones do you think you could rack up the most game homeruns at? Ha, nice, and good question about the stadiums. Camden Yards would be No. 1, followed by Kauffman Stadium. Man oh man, what I’d accomplish with season tickets at either of those places. 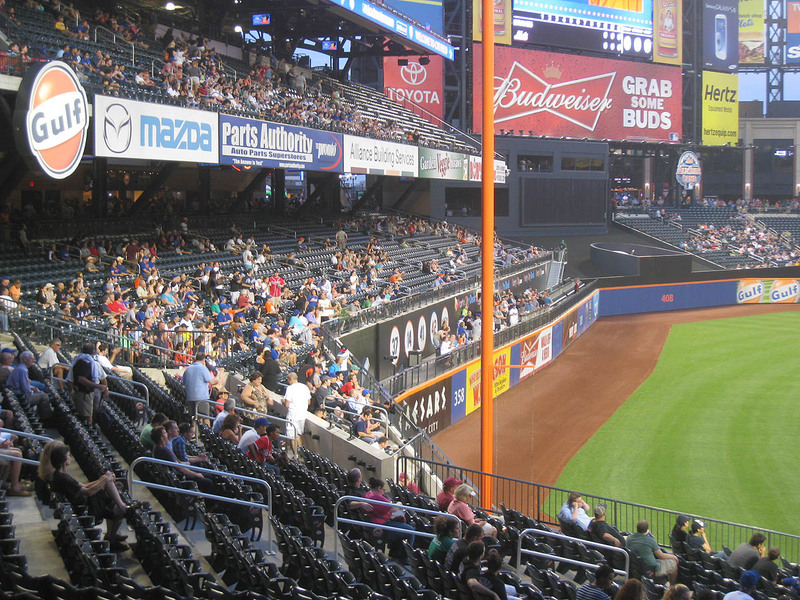 I’d do well in L.A. in the area below the bleachers, Cleveland in the standing-room area, Denver in the “handicapped” aisle in left field, and so on. Hell, give me a seat in the front row in center field at Fenway (next to the Monster) — and let’s not forget Ameriquest Field. My goodness. Wow, that guy sounded like a typical run of the mill idiot. Everyone loves a set of beer muscles. 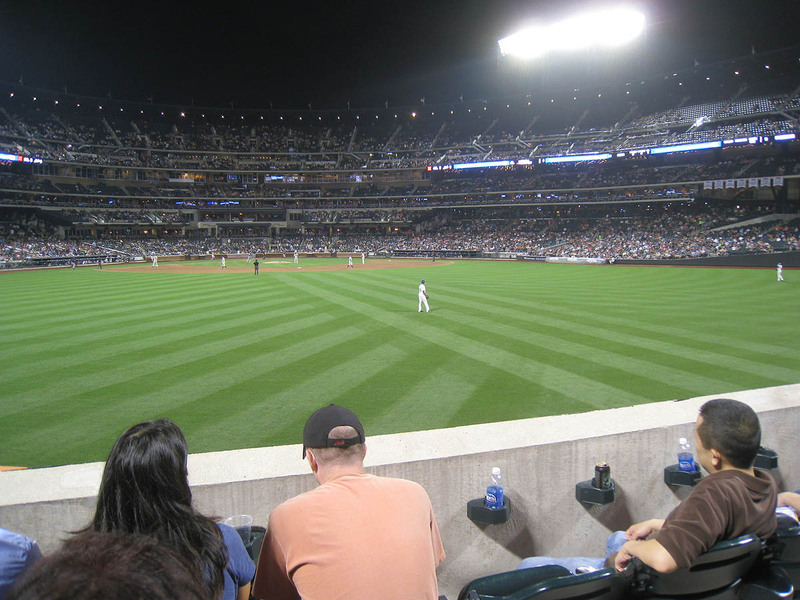 Double digits at Citi aint’ nothin’ to sneeze at, either, nice job. You thinking of going this week vs the Nats? I hope they’re still using those old commemoratives. I wonder if on the Mets broadcast Gary Cohen said anything about it being you. 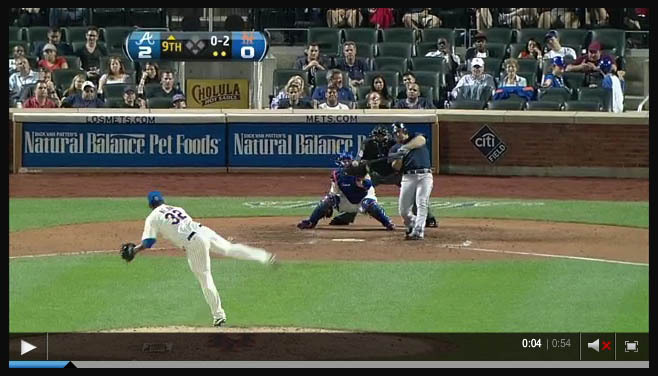 Have you considered the official “Hample Jinx” for Medlen? 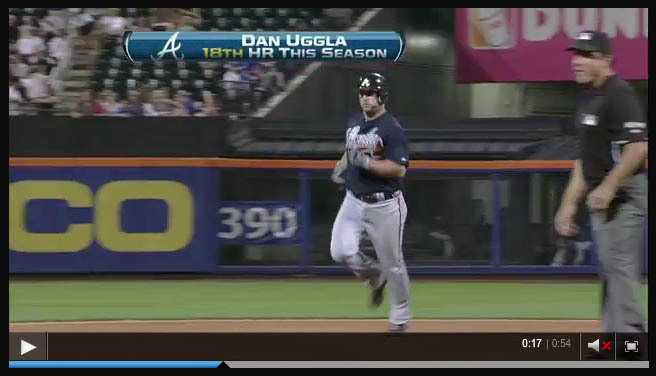 I’m ashamed to say I was watching Uggla’s HR live and didn’t recognize you. 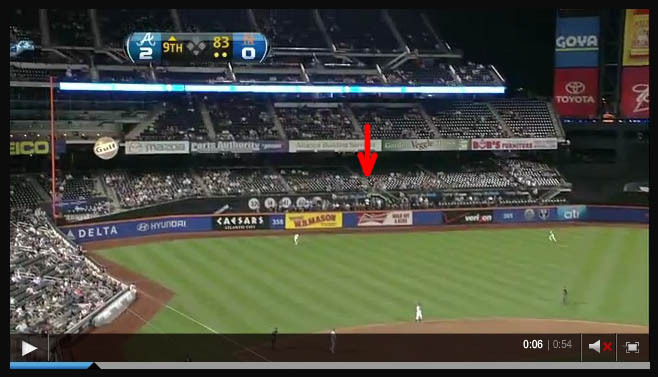 I guess if FSN would’ve shown you for more than one second, I would have noticed. 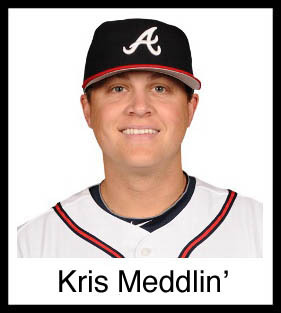 BTW, don’t curse Medlen. He’s our best pitcher and we’ll need him down the stretch. “Beer muscles.” Ha! 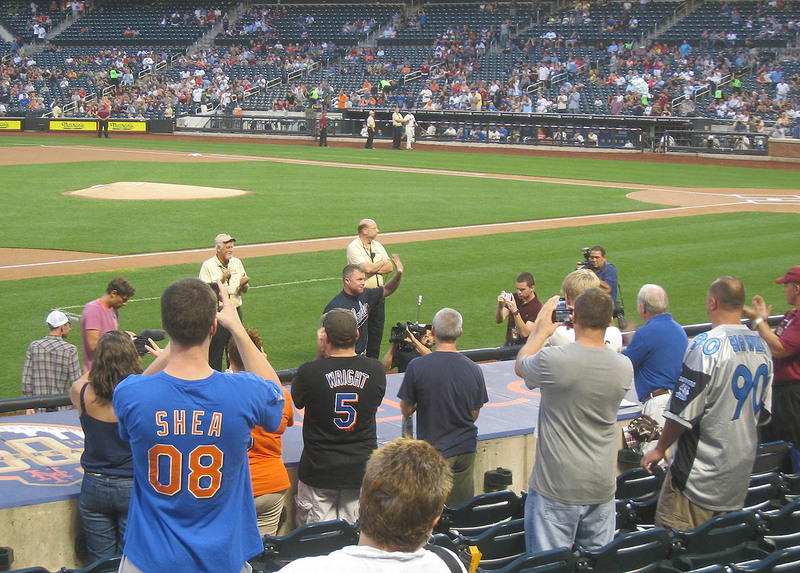 I might be at Citi on Monday if things in Lowell wrap up early enough for me to get back in time for BP. I’ll probably be at Citi on Tuesday (assuming things in Lowell don’t require an extra day), and if I don’t go to Baltimore on Wednesday, then I’ll be at Citi. So . . . who really knows? I doubt it because I ddin’t get any emails. If people had seen me on TV, I probably would’ve heard from them. Nah, he hasn’t cost me any baseballs, and I actually think he’s pretty cool. Also, I gotta respect a five-foot-nine-and-three-quarters right-handed pitcher who can make major league hitters look bad. I thought of you after I caught it and wondered if you were watching. Damn! Al, you missed last year’s special feature! Zack, you definitely should go to Camden Yards on Wednesday! It’s Tim’s 6th MLB Anniversary game! So I went to a minor league game yesterday, and there was a home run that a pitcher retrieved. I asked him for it, and he gave me the other ball that he had in his hand and said that it was the home run from earlier in the game. Should I believe him? Zack, the weather should be nice in KC when we are there. I hate the heat of mid summer. I will have to e-mail you when it gets closer to maybe hook up when we are there. Can I still get a hold of you at ZMan69@youngjewgirls4rent.com? What’s the word on the drop? All good?? If I did that, chances are . . . Trent and I would catch 95 percent of the home runs. Ha! I like how you think. As for the drop, I tweeted about it yesterday. It was called off at the start because it was too windy. We’re already planning to try again next season. You guys are definitely gonna be there? I’m actually not sure now if I can make it. Sounds a bit fishy. He *could* be telling the truth, but why would he be walking around with THAT ball in his hand? It changed to “dot org.” I thought I let you know. As for KC, we might have to do our catching up at the stadium because . . . for me, this trip is all about my girlfriend. Her family lives in KC, and she has LOTS of stuff planned for me when I’m not at Kauffman. It’s going to be tough for me to even find the time to attend all three games, so I just don’t know how my schedule is gonna shake out. Nice catch tonight Zach! 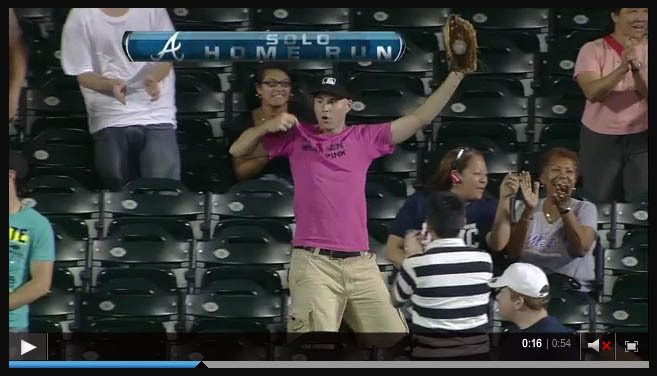 I saw your catch on the Tyler Moore hr while watching the nationals! I love what you’re doing dude. I live up in Canada in Vancouver, and I’m definitely jealous with the amount of games you go to. I usually convince my buddies to attend one Mariners game a year since it’s the closest option for MLB. Up here, we have an A-League team in the Northwest League, and I’ve been a bit of a ballhawk at their games and during their practices for a couple years. I’ve collected about 30 balls so far. I’ve got 1 MLB ball after I snagged a foul ball at a Mariners game a couple years back. 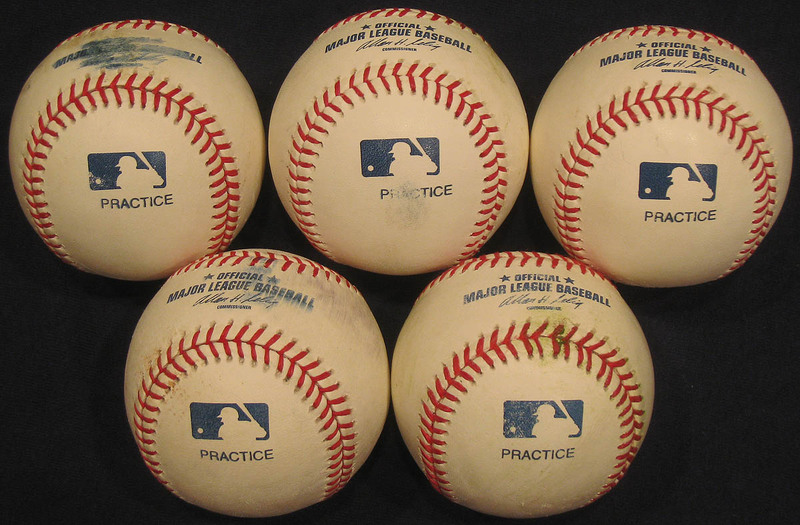 Just wondering, any interest in making a 1 for 1 trade of one of your MLB balls for a highly coveted official Northwest League ball?? Haha, it sounds funny, but hey, maybe it would be something you’d like to add to your collection. Keep on hawkin man, and maybe we’ll catch a Mariners game someday. Second Posting – Baseball related, My 11 year old daughter is a junior journalist for Baseball Youth Magazine and http://mlbreports.com. We live in NYC and wondered if you would be interested in doing an interview with her for MLB Reports? We are also a family that is trying to complete quest for 30 over the next four years and this summer marked our half way point. The following are links to some of Haley’s interviews for your review. If this is something you would consider please get back to me so we can make some arrangements. Thanks so much. I appreciate the offer, but I’m gonna pass. I actually once spent an entire summer working for the Boise Hawks, so I got enough Northwest League balls to last a lifetime. Safeco Field is awesome, and I really want to make it back, so we very well might end up there together someday. Let me know when you’re gonna be there, and I’ll tell you if I have plans to be there too. Thanks for the restaurant recommendation. I’m actually going to be in KC next weekend with my girlfriend, who grew up there, so I’ll mention it to her. AS for the interview, yeah, I’d be happy to do something with you guys, so let me know how you’d like to proceed.